The beauty and charm of the Cook Islands is matched only by the warmth and spontaneous hospitality of the locals. The culture is expressed through music and dance, and the islanders take great pride in traditional songs, Sunday hymns, and the distinctive crafts which exist in their day-to-day lives. Rarotonga is the largest of the fifteen islands, with white sand beaches and a high mountainous interior, encircled by a protective reef and lagoon. Partly volcanic and partly atoll, Aitutaki boasts a crystal clear turquoise lagoon and white sand beaches , perfect for watersports. Leave the crowds behind, and enjoy a truly unique island getaway. No chain hotels or restaurant franchises here, but a myriad of intimate bungalow hotels to fine resorts, excellent dining choices and a wealth of activities. 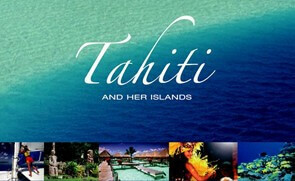 Step back in time and enjoy true Polynesia in a unique and pristine vacation or honeymoon destination. Day 1 – West Coast to Cook Islands. This evening depart Los Angeles for your vacation or honeymoon in the enchanting Cook Islands, the jewel of the South Pacific. Day 2-6 – Enjoying Your Cook Islands Vacation. A warm Kia orana (welcome) awaits you from our local representative on arrival in Rarotonga. 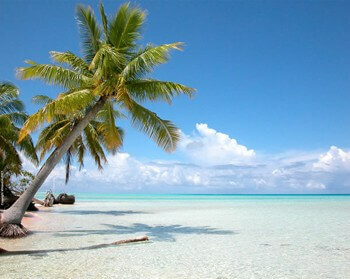 The next 6 days are yours to enjoy the Cook Islands. Calm, peaceful and charming are words that only begin to describe the serenity of these lands. Visit the Cultural Village, enjoy a traditional Island Night, or simply laze on soft white sand beaches. Day 7 – Cook Islands to North America. This evening transfer to the airport for your return flight to Los Angeles. (*) Prices are in USD, ‘from’ per person, based on double occupancy, unless specifically noted. Single or extra person (triple) supplements apply. Package rates are inclusive of room tax & VAT, International air-inclusive packages rates also reflect airline fuel surcharge and U.S. airline taxes and fees. Strictly subject to availability at time of booking. Black out dates, minimum stay requirements, seasonal surcharges, currency exchange fluctuations, and other restrictions may apply. Prices, itinerary and conditions are subject to change without notice. Clients may be responsible for local city taxes, bed taxes and airport departure taxes not included with the international ticket. Information will be provided at the time of booking. Pricing based on low season (Nov.-March, holidays periods excepted). (**) all hotels listed except Muri Beachcomber and Royal Takitumu include breakfast. 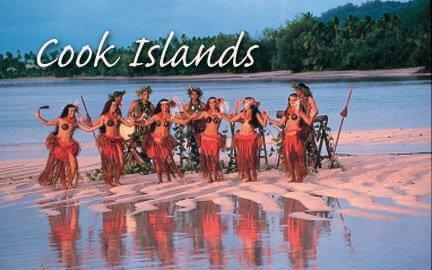 Many more Cook Islands resorts and hotels available for all budgets! Package can be extended to 12 nights. US departures on Air New Zealand depart Sundays and return Saturdays. Set directly on a long white sandy beach on Rarotonga’s sunshine coast, the Rorotangan Beach Resort & Spa has just recently completed major renovation of its garden and beachfront rooms. All 156 rooms have satellite TV, DVD, IDD phones with data ports, CD players, mini bar, fridgerator, tea and coffee making facilities, air conditioning and fans. There is a PADI Dive Center on site, numerous water sport activities, and a fresh water swimming pool. Here you will find world class snorkeling in the marine preserve just steps off the beach. Guests can enjoy shows and music every evening at Tree tops Verandah Restaurant. During the day more casual dining is available at the Poolside Café & Bar. SPA Polynesia offers an extensive menu of tropical spa and beauty treatments.New at the Rarotongan Beach Resort is The Sanctuary, Cook Islands’ newest adults-only resort with private beach, adults only restaurant, pool, and swim-up pool bar. All Beachfront rooms, perfect for honeymoon couples, aniiversary and romantic getaways for adults. Located on Rarotonga’s premier beach, the Polynesian style Pacific Resort Rarotonga has 64 rooms, from affordable garden units to private beachfront villas, in a luxuriant tropical garden setting. The beachfront fresh water swimming pool and restaurants are ideally located for leisurely hours of sun and relaxation. 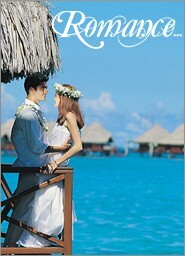 The Pacific Resort offers Rarotonga’s largest lagoon area with its own tropical offshore islands. Paddle a kayak across sheltered waters to a deserted island, enjoy a glass bottom boat excursion and marvel at the coral and tropical fish. Rediscover life’s pleasures and the paradise you’ve been dreaming about. Nestled among 4 acres of luxh tropical garden on the beach of Rarotonga’s West Coast, this tropical paradise offers Polynsian hospitality, relaxation, and individual villas for ultimate privacy. The resort’s 21 spacious one and two bedroom villas are located poolside, in the gardens and absolute beach front. All are fully air conditioned with ceiling fans, self contained kitchen, color TV/VCR, radio/CD player and verandas. The resort features two restaurants, the Windjammer which is a fine dining restaurant and the Crown Beachside Restaurant for casual meals and drinks. There is also a Spa and Massage Complex on the property that offers a complete range of treatments. One of Rarotonga’s newest retreats, the Rarotonga Beach Bungalows are located on a white sand beach fronting the turquoise lagoon with one of the best snorkeling and kayaking areas on the island. Each of the 5 deluxe, Polynesian style bungalows captures the Polynesian flavor with their thatched roofs, and old style design furniture of unique exotic wood. The mood of the interior captures the local, native, tropical charm of yesteryear. All of the bungalows have a large deck with teak furniture, a separate lounge, kitchenette and dining area, a large air-conditioned bedroom and a bathroom featuring a tropical ‘garden’ shower. Modern conveniences include cable television and private phone line. Internet access is available. Rarotonga’s finest beach is a blaze of white sand that stretches unbroken for miles. Guest of Takitumu Villas will experience the beauty of this beach and the azure Titikaveka Lagoon. The resort complex features 10 spacious one-bedroom villas whose South Seas-style architecture blends with the contemporary creature comforts. Air conditioning, spacious lounge, huge beds and a bathroom with a spa tub, plus a full kitchen and verandah, ensure that your villa is an island home, par excellence. The resort also has a fresh water swimming pool. White sand beach, turquoise blue lagoon, magical sunsets, night skies filled with millions of stars, the scent of tropical flower – the Manuia Beach Boutique Hotel offers a tranquil and romantic get away. The hotel offers 24 thatched bungalows set in a lush tropical garden. Six of the rooms are located right on the beach with views of the lagoon and Pacific Ocean. All rooms are fan cooled and air conditioned, have a refrigerator, tea and coffee making facilities, private balcony. Enjoy dinner in the Sand Bar and Restaurant and experience international cuisine with the flavor of the south Pacific. location on the Aitutaki Lagoon, one of the most beautiful lagoons in the South Pacific. The palm trees are magnificent, the sandy beaches white and soft – a place where time is measured by the sun and moon. This boutique resort with only 28 bungalows, brings back the gracious days of a bygone era. Polynesian architecture, colonial furnishings, fine food and wine. The dream is a reality. Each of the air-conditioned, beachfront bungalows has IDD telephones, in-house DVD/TV, kingsize beds, private verandahs, refrigerator and tea/coffee making facilities.The resort facilities include a fresh water swimming pool; complimentary airport transfers, guest laundry service, canoes, kayaks and snorkeling gear; a Beach bar/poolside café, and Fine dining restaurant. Located on its own private small island, the Aitutaki Lagoon Resort & Spa offers great views across the Lagoon of Aitutaki. The 37 bungalows are spacious, air conditioned with ceiling fans, have tea & coffee making facilities, king size beds, CD players, and satellite TV. You have a choice of dining at Ru’s Beach Bar or the Lagoon Restaurant. The SPA Polynesia offers a full range of spa and beauty treatments. 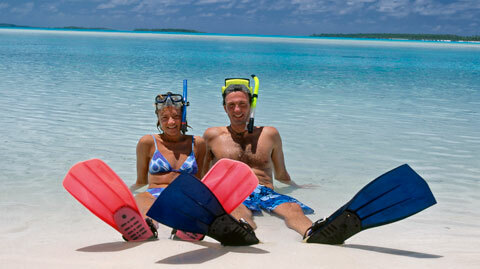 Snorkelling excursions and Scuba diving can be arranged by the hotel. Only overwater bungalows in the Cook Islands! 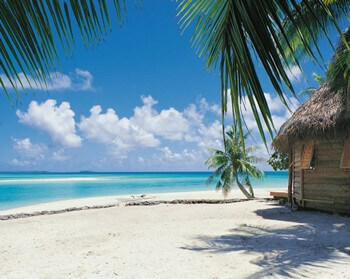 On Aitutaki, the Are Tamanu Beach Hotel has just 12 tradional, thatched roof, self-contained bungalows. Located on the white sand beach and Aitutaki’s beautiful lagoon, this picturesque family run hotel is quiet, peaceful and intimate. The bungalows are located in a tropical garden and offer views of the lagoon on their large deck. The hotel’s Poolside Bar is the perfect place to enjoy breakfast, a light snack and a cocktail at sunset. Now combined into the larger Tamanu Beach Resort with a total of 22 traditional Polynesian bungalows, all facing the beach and turquoise lagoon. Each of the air conditioned bungalows has a separate lounge area, kitchenette with breakfast bar, bedroom with king size bed, a modern bathroom and IDD telephones. Complimentary to all guests are masks and snorkels, bicycles and lots of smiles. Tamanu Beach Resort is the perfect setting for Cook Islands weddings and honeymoons with a ‘no children policy, very private, peaceful surroundings and breath-taking scenery and sunsets.